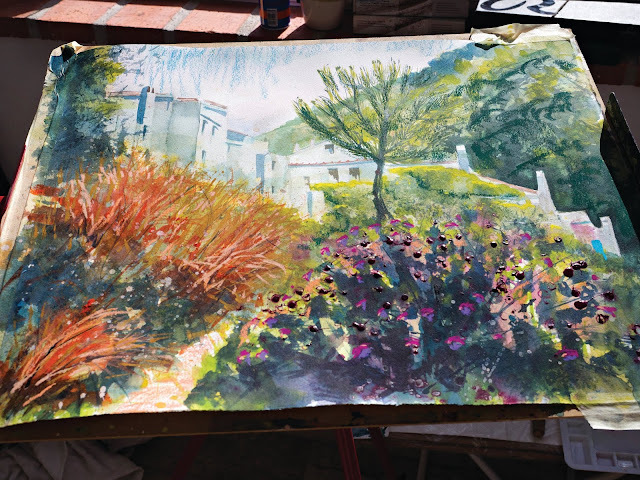 Derwent Inktense have proved to be a real hit with students once again - this time with 'Paint Andalucia' near Torrox in Southern Spain. 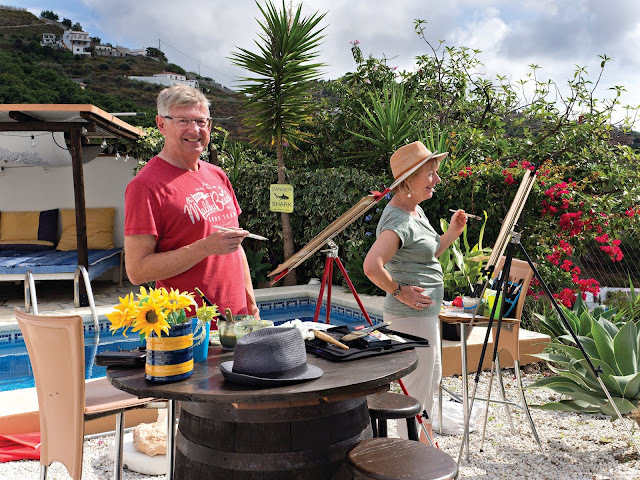 Using the all new 'Inktense Paint Pan Travel Set' the versatile ‘go anywhere, do anything’ portable 12 colour set inspired everyone to create lots of colourful and expressive paintings during our exciting art week together. Mavis using a large brush to paint with select colours from the Derwent 12 colour Paint Pan Travel set to create the first wet in wet techniques for her Spanish landscape painting. Clean colours every time! 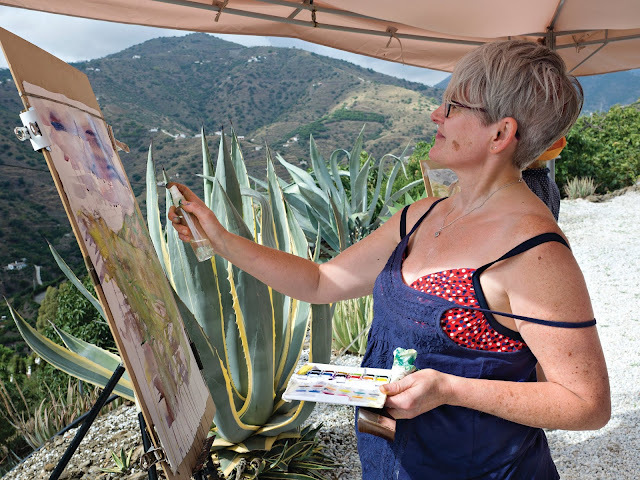 Creative adventures included painting both outdoors and in the studio painting the dramatic and scenic locations in the quieter regions of the Costa del Sol. 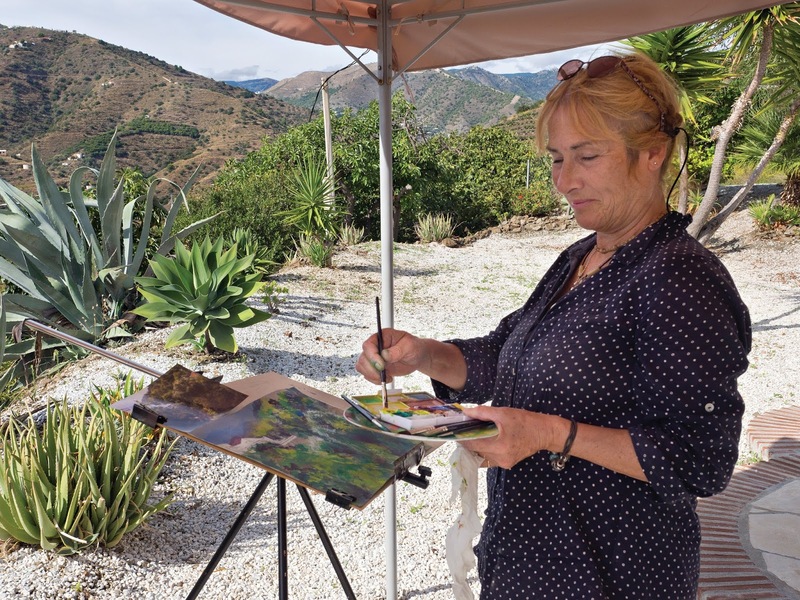 With several trips to iconic whitewashed and unspoilt mountain villages in the region during the week this allowed all Paint Andalucia art holiday guests the wonderful opportunity to work directly out doors with the this versatile painting media. 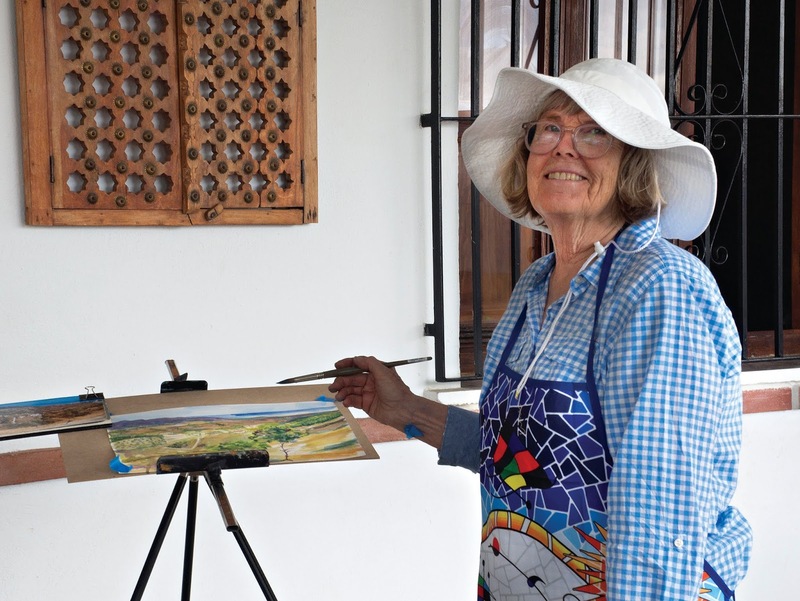 Lorraine using Derwent Paint Pan Travel Set Inktense colours on Canson Mi-Tientes Touch 350gsm pastel paper to create a colourful and expressive interpretation of her chosen subject, El Acebuchal - the hidden mountain village we all visited and painted later in the week - a lovely colourful painting Lorraine! Lorraine's painting half way through. Notice how intense those colours are in all the right places and subtle when needed in others. Such a responsive media! A small box that packs big impact! The paintings everyone created with the Derwent Inktense Paint Pan Travel Set where rich in colour, multiple layered and full of depth. 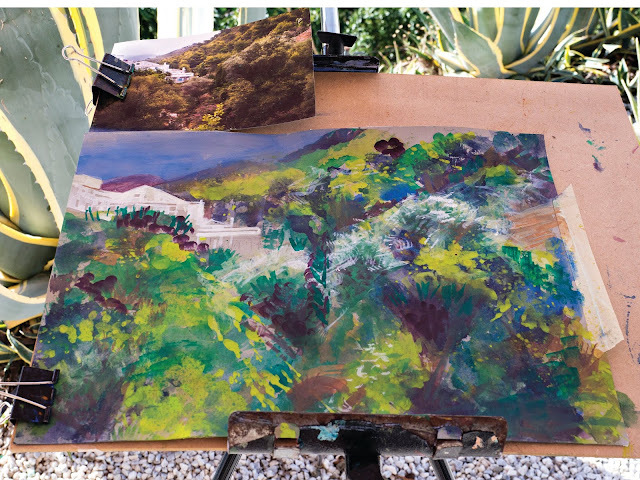 Above all they proved to be a joy to use and easy to create stunning paintings again and again. 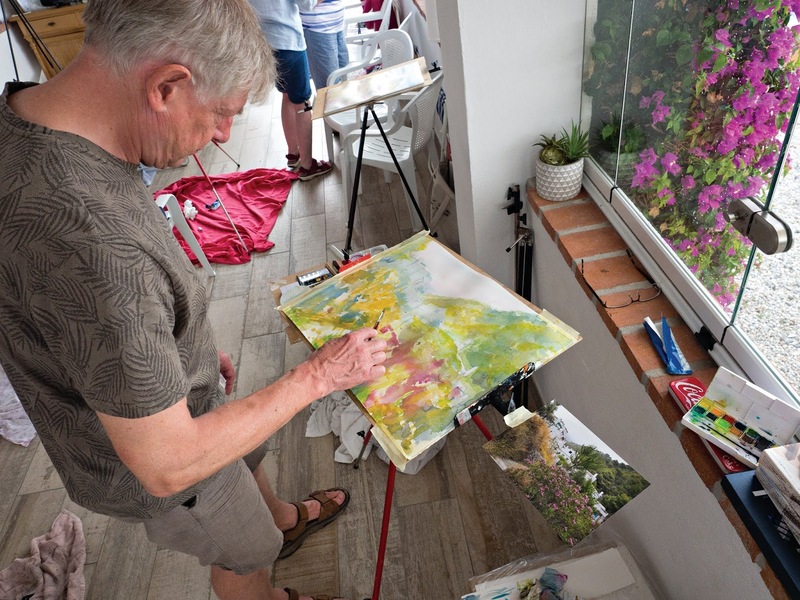 David exploring foreground detail with applications of the next stage washes to build his richly layered Inktense painting. 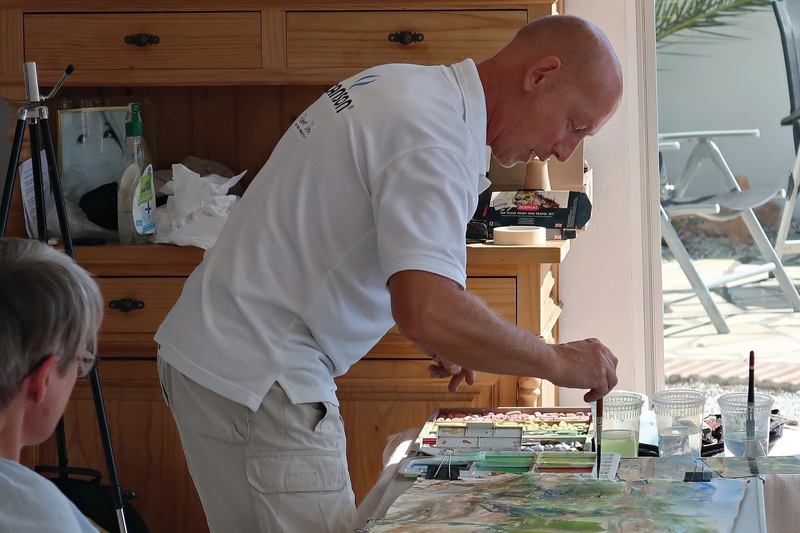 Once dry Inktense is permanent - a big advantage for artists like David who want to create clean gazes of colour one over the other during the painting process. Davids finished painting. A superb range of both painted and drawn marks explored with combinations of media - Inktense and soft pastel. 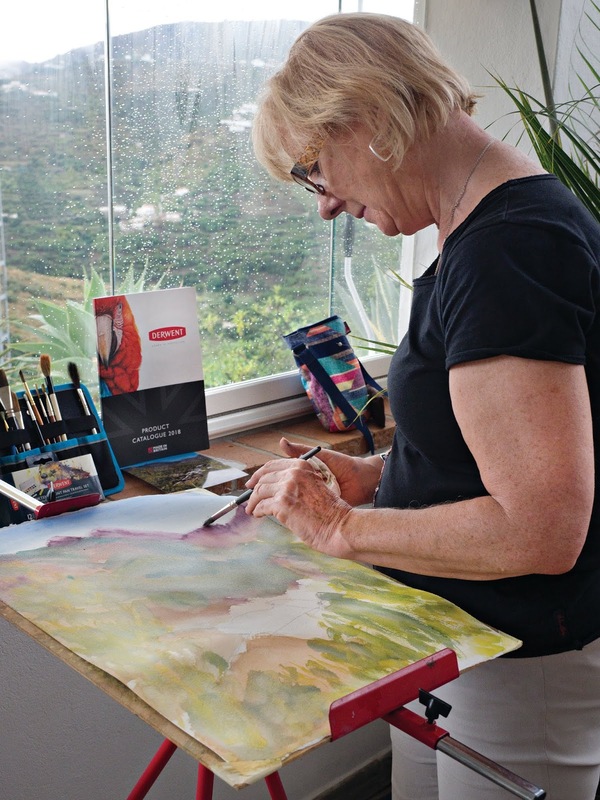 Pam adding sharp bright detail with combinations of colours with the Derwent Paint Pan Travel Set to bring everything together in her expressive and colourful Spanish landscape painting - great layers with added depth Pam! 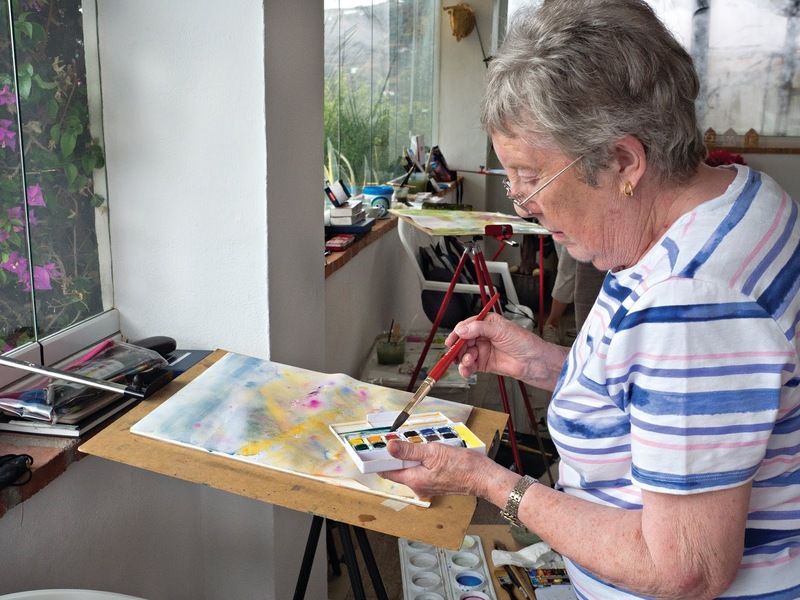 Jackie painting first stage washes wet in wet with Derwent Inktense Paint Pan Travel set colours and exploring the different mark making possibilities even in the early stages with different types of brushes. As a Derwent Associate Artist it was a privilege to teach everyone on the holiday so many different techniques with Inktense. Following my regular demonstrations during each day both outdoors and in, everyone’s confidence with the media just grew. Creative techniques explored kept everyone fully focused with this inspirational landscape and exciting media and the work everyone created was really stunning. 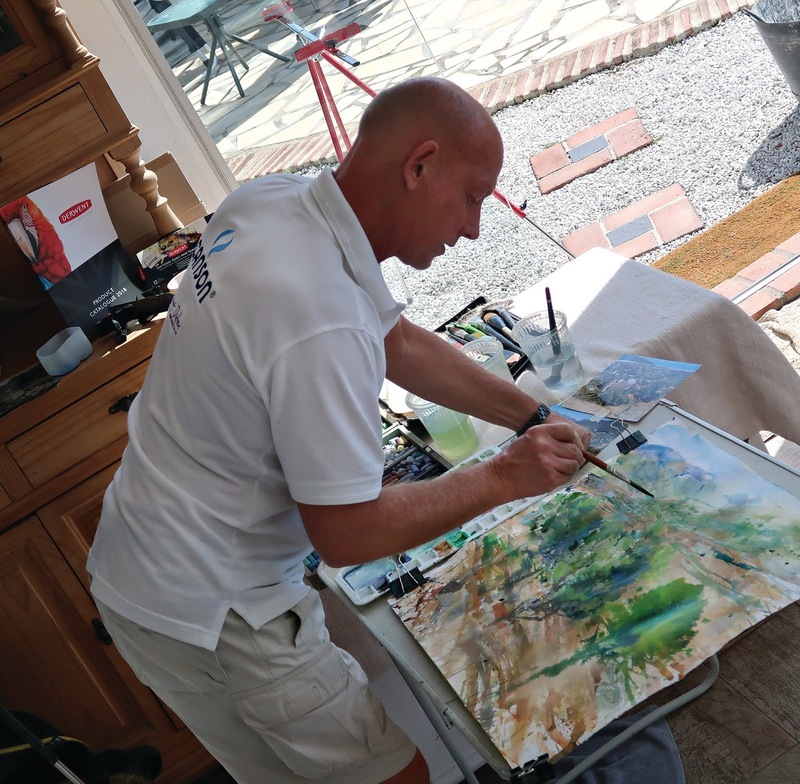 Demonstrating the versatility of Derwent Inktense, the Paint Pan Travel Set as an underpainting for final marks with soft and hard pastel. 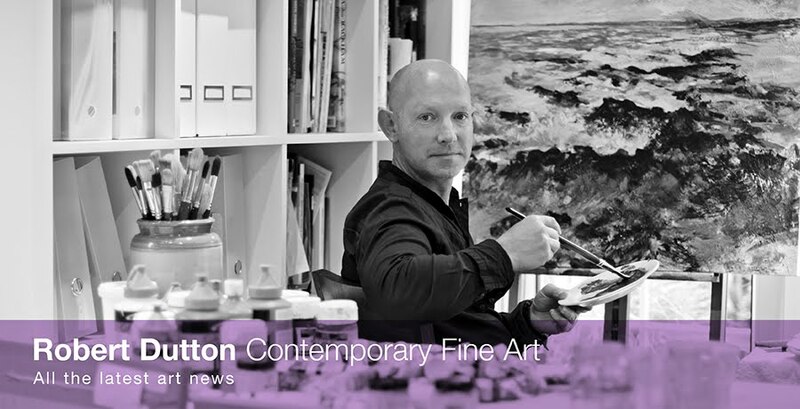 All brushes and mark making created expressively and freely with such a easy to use media. (Photo courtesy of David McCallum). Watercolour glazing techniques made possible with the quick drying permanent Inktense colours. (Photo courtesy of David McCallum). Close up of the expressive painting techniques made possible with this really responsive clean glazing and painting media - Derwent Inktense (Photo courtesy of David McCallum). "The Derwent Inktense Paint Pan Travel Set seemed, on first appearance, to be one of those paint sets you might receive as a present from an aunt as a child. But, upon usage, I was pleasantly surprised to find how versatile it was. The colours are well chosen and the range you can produce by simple mixes was extensive. 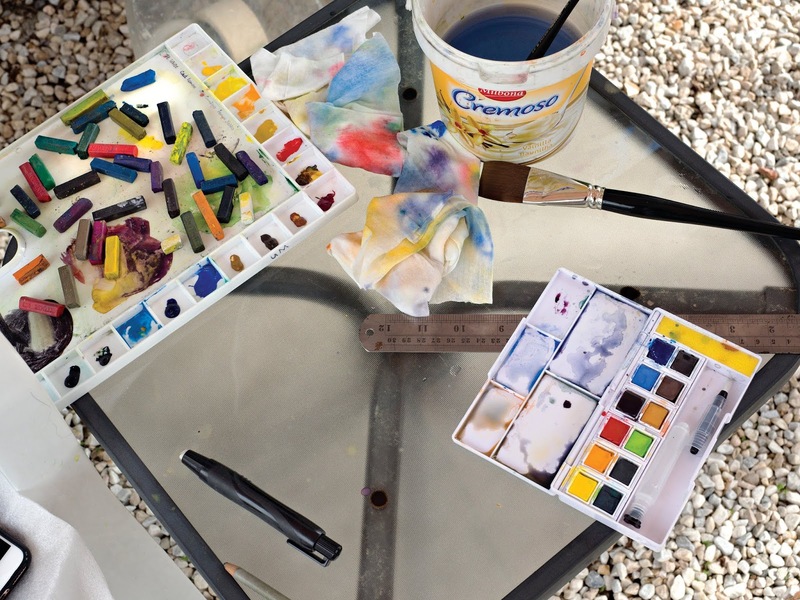 The mixing guide in the accompanying brochure was so very helpful and accurate - and this made a big difference to my artwork when using the set. It would be great if Derwent could somehow incorporate the chart into the box; in that way, the set really would be the perfect travel companion. Once I had discovered and understood for myself how permanent the Inktense colours are when applied to paper, it was plain sailing. I thought the effect of various glazes on the painting surface was terrific. More satisfying than watercolour, I would say (though that may be down to experience and a narrow range of watercolour tubes in my possession). Certainly, with the mixing guide, the set was pretty fool-proof. And I shall definitely be using it again. A huge thank you to Derwent for generously providing the set." "What a great week that was. We both learned so many new skills and it was a pleasure to use the materials that you had generously provided. The inktense palate was a cute little box but surprisingly comprehensive in terms of both the colour range and mixing potential. We were both impressed by the strength of the colours. However as you demonstrated the versatility of the product was greatly extended by adding in other watercolours and gouache." "Just completed a week’s painting holiday in Andalucia, and have been introduced to Derwent watercolour inkblocks. The colours are a nice combination and easy to work with, especially the purple. 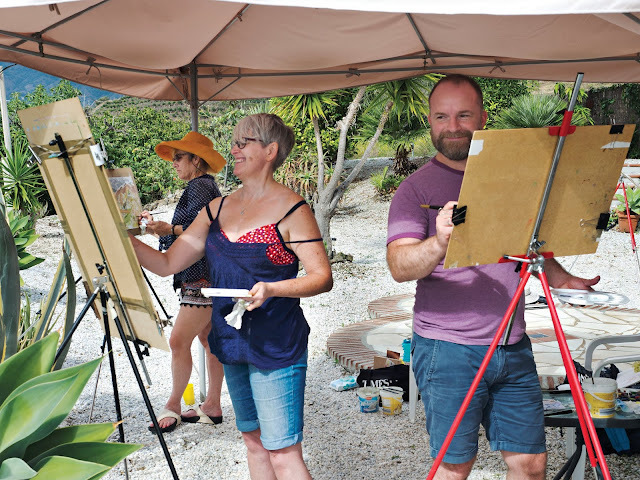 Their vivid strength adds a new dimension to what I may be painting in the future and I am really excited about the possibilities presented by Robert Dutton during this week." 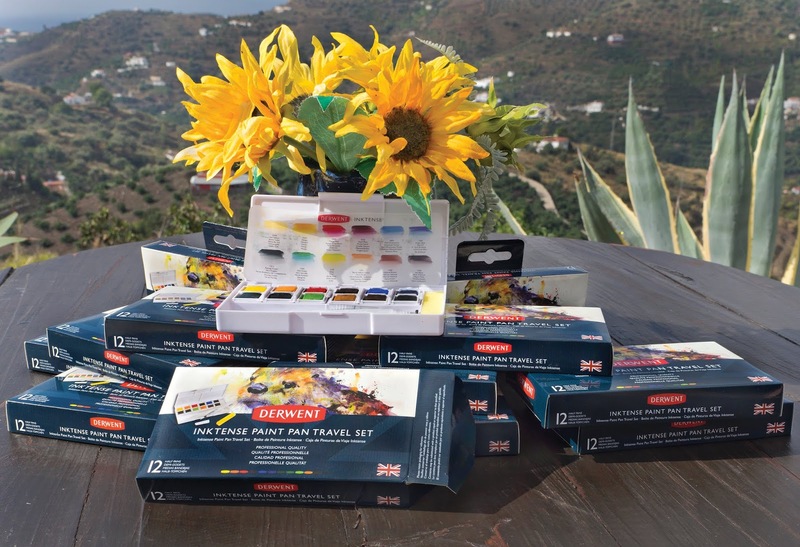 "Delighted with the Derwent Inktense Paint Pan Travel Set. 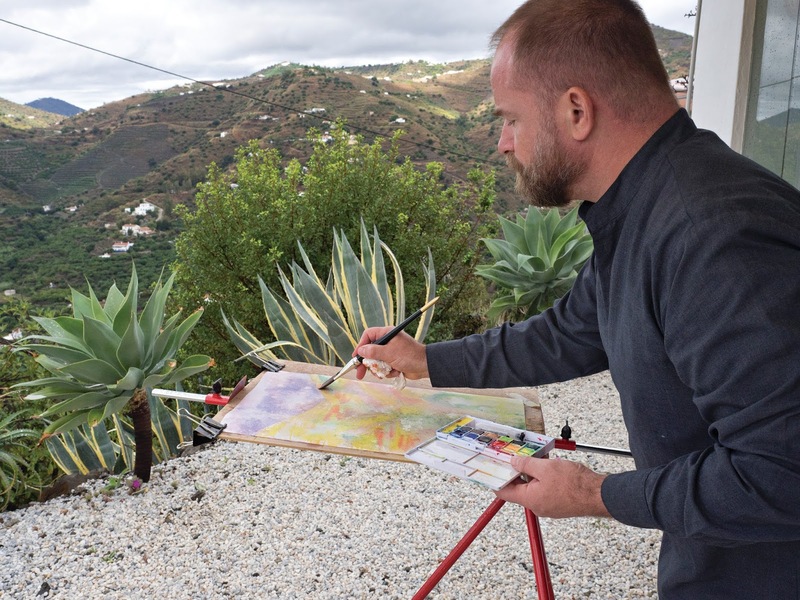 As a novice artist I obviously cannot compare it with any other medium but I really liked the colours, how well it mixes up to quite a strong colour and the great ways it can be used. RD made the medium very accessible and it seems to have a multitude of uses which I look forward to investigating further. Nattily sized, it will be easy to carry around but it strong enough colour to ensure a great result." A BIG THANKS to Derwent for generously sponsoring part of this year’s superb painting holiday in Southern Spain with a top quality Paint Pan Travel Set given to all. Guests travelling home as far away as Canada and America most certainly will be taking home not only great Inktense paintings and happy memories, but lots of useful art techniques as well that will enrich their future painting experiences - all thanks to Derwent! Creative adventures await for you in Southern Spain! Welcome to the midnight hour!